All About Reading is a complete program that teaches phonics, decoding, fluency, and comprehension in a fun and engaging way.What is All About Reading?All About Reading is a fun and engaging program that starts with essential pre-reading skills and continues on to teach all five key components of reading. It contains everything your student needs to become a fluent reader for life!Easy to Learn!Powerful teaching methods are at the center of All About Reading.~Multisensory approach makes it easy for kids to understand~Built-in review system helps learning stick~Kids look forward to reading lessons because of the motivating, hands-on activities~This mastery-based, building block program works with kids who have learning disabilities as well as those who do not~Our explicit teaching helps students succeedEasy-to-TeachAll About Reading makes your job easy and stress-free.~Everything is planned out for you with “open and go” lesson plans~Lessons are organized and lightly scripted so you don’t have to figure out what to teach next~You don’t have to worry about missing some critical element of teaching reading – it’s all includedFREE LIFETIME SUPPORT is offered by All About Learning Press. All About Spelling will help your student become a proficient speller for life! We take the struggle out of spelling!Our lessons are multisensory, created to teach children the way they learn naturally, with sight, sound, and touch. Your child will use letter tiles on a white board, flashcards, word banks, customized spelling lists, dictation, writing exercises, and 100% decodable readers throughout the program-Teacher's Manual is extremely easy to use-Lightly scripted-You'll know exactly what to do each day-Teaching tips just where you need them-No previous teaching experience necessary-Lessons take 15-20 minutes per day-Who Is All About Spelling For?This program is for two groups of learners: Beginners & Struggling LearnersThe Basic Interactive Kit is required for this program and includes these four items: Letter Tiles, Magnets for the Letter Tiles, Phonogram CD-ROM, and the Divider Cards. This is a one-time purchase, and you will use it in Levels 1 to 7. The decision to homeschool is difficult. There is so much to learn, and there are often radical changes that take place in your family. Unfortunately, not everyone will be supportive.Well-meaning friends and relatives may believe you are going to “ruin your child.” How can you make sure that you have laid a good foundation for your child’s future? How can you respectfully defend your choice to those who disagree with you?You’ve made the decision to homeschool. Suddenly, you find that some of those who were once in your corner supporting you are now questioning your competency as a parent and maybe even your sanity. Their lack of confidence may sting, but in reality, the critic provides a wonderful opportunity to replace fear and stigma with truth and reality. This book equips you to answer the critic in your life with resolve and confidence.ANSWERS to help you become confident in your homeschooling journey!-Socialization-Qualifications-College-Legality-Academics-Sports-Affordability-CompetencyTable of ContentsIntroduction1. Is Homeschooling Legal?2. Are You Qualified to Teach Your Child?3. How Can You Afford to Homeschool?4. Is That How It’s Done in Public School?5. What about Accountability?6. What about Socialization?7. Isn’t Sheltering a Child Harmful?8. What about Being Salt and Light in Public School?9. Is Homeschooling Elitist?10. Will Homeschoolers Be Good Citizens?11. What If I Don’t Have Enough Patience?12. What Does Dad Do in Homeschooling?13. 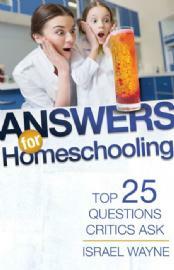 Can Every Family Homeschool?14. Are You Cut Out for This?15. Won’t I Be Wasting My Own Education?16. What about Public School at Home?17. What about Vouchers for Homeschoolers?18. How Can You Teach Multiple Grades?19. What about Special Needs Education?20. What about Extracurricular Activities?21. What about High School?22. What about College?23. How Can You Find Time for Everything?24. Do You Know What Causes That?25. How Should I Respond to Opposition? 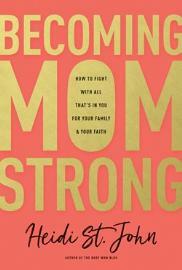 Becoming Mom Strong: How to Fight With all That's In You For Your Family and Your FaithHave you ever looked into the faces of the people who call you “mom” and wondered what in the world you got yourself into?If you’re like many Christian moms today, you’ve been reading the headlines and watching the rapid-fire changes in our culture with frustration and fear. Let’s face it: Moms today are facing questions that previous generations didn’t even see coming, and even our right to determine what is best for our own children is under fire. 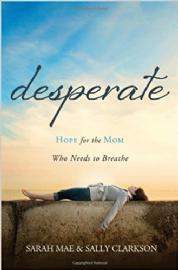 Popular speaker and blogger Heidi St. John (The Busy Mom) believes that today’s mothers need a special kind of strength. We need to be strong in the Lord and in the power of His might. We dare not rely on human strength for the battles we’re facing right now. In Becoming MomStrong, Heidi has a powerful message just for you—the mom in the midst of it all. Through encouragement, practical prayer points, and authentic “me-too” moments, Heidi equips you for a job that only you can do: to train your children to hear God’s voice and to walk in truth no matter where our culture is heading. God wants to use this generation of mothers to do something extraordinary:-To be strong in the Lord-To know who you are in Christ, and-To impart that strength to your kids.In other words, He wants you to be MomStrong! So if you’re feeling tired or inadequate today, get ready to find new strength as you join Heidi St. John in Becoming MomStrong. 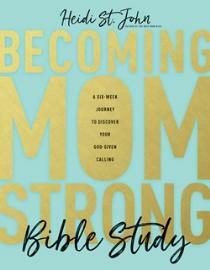 Becoming MomStrong Bible Study: A Six-Week Journey to Discover Your God-Given CallingA six-week guided journey of learning to trust God with your deepest parenting questions.There’s nothing wrong with good advice—but today’s moms need so much more than that. We moms are crying out for true wisdom and strength that will teach us how to parent our kids well, and to help us navigate challenges and cultural issues previous generations never saw coming.The Bible tells us that the beginning of wisdom is knowing the Lord. And that’s right where the journey to becoming MomStrong starts.Join Heidi St. John in this six-week Bible study based on her popular book Becoming MomStrong. Each week, you’ll find stories from Heidi, Scriptural reflections, encouraging Bible verses, and prayer prompts to help train your own heart—and your kids’—to know Scripture, hold biblical values, discern true teaching, and develop godly character.A great resource for churches, women’s groups, or individuals, the Becoming MomStrong Bible Study will help you seek God’s guidance every day in your parenting hopes, fears, struggles, and victories. Emphasis on traditional grammar as well as practice with vital reference skills and step-by-step use of the Writing Process for eight different types of writing assignments. Written by Bob Jones University Press. The Answer Keys and tests from Christian Liberty Press (for Grade 2-6) make this program an affordable alternative. Complete Canadian GED(R) study guide, prepared by our dedicated team of exam experts, including practice test questions. Everything you need to pass the Canadian GED(R)!The Canadian GED(R) Study Guide will help you:-Increase your score with multiple choice strategies from exam experts-Practice with 2 complete practice question sets (over 500 questions)-Make an GED(R) study plan and study schedule-Learn what you MUST do in the exam room-Avoid common mistakes on a test-Answer multiple choice questions strategically 2Sets of practice test questions including:-Reading-Mathematics-Algebra-Geometry-Language Arts - Writing-How to write an essay-ScienceIncludes Multiple Choice Strategy!-Powerful multiple choice strategies with practice questions -Learn 15 powerful multiple choice strategies and then practice. -Answer key for all practice questions with extensive commentary including tips, shortcuts and strategies to increase your score! -Tips and strategies not found anywhere else!Hundreds of pages of review and tutorials on all GED topicsGED(R) is a registered trademark of the American Council on Education, who are not in-volved in the production of, and do not endorse this publication.Practice Makes PerfectThe more questions you see, the more likely you are to pass the test. And between our study guide and practice tests, you'll have over 500 practice questions that cover every category. You can fine-tune your knowledge in areas where you feel comfortable and be more efficient in improving your problem areas.Our test has been developed by our dedicated team of experts. All the material in the study guide, including every practice question, is designed to engage the critical thinking skills that are needed to pass the GED(R) Exam. They will not be the exact same questions you'll find on the exam, but they are similar.And like the GED(R) exam, the practice tests are weighted differently so you will be exposed to questions in all areas.Why not do everything you can to get the best score on the GED(R)? From the Psalms to your HeartSeasoned pastors speaking from the Psalms to your heart about life’s struggles and Christ’s saving grace – that about sums up the year’s worth of meditations found in Christ’s Psalms, Our Psalms – Devotional. 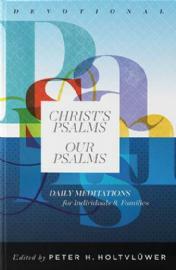 Whether serving God’s people in a settled church or ministering to new believers on the mission field, the sixteen ministers behind the devotions know the troubles Christians face and how God provides real relief and comfort in the Lord Jesus Christ.Our PsalmsChristians everywhere love the Psalms. They have touched the hearts and lives of countless believers for centuries. They speak to both our plights and our prosperity, our gaffes and our gifts. They teach us deep truths and bring us profound comfort. The Psalms give us words to praise our God and pleas to cry out to him in prayer. The Holy Spirit has truly made them to be our Psalms. Each meditation connects a key thought from the psalm to our daily lives and lets us take them over for ourselves.Christ’s PsalmsBut there’s another dimension to the Psalms. Each also speaks of Christ Jesus in various ways. We may see the outline of Christ in David’s experiences – in his intense suffering and waiting upon God, in his victories and success, in his role as the King who defends and judges. Jesus fulfills all these. We can see the Son of God lifted up on the praises of so many psalms and the One in whom every believer finds ultimate refuge. We also catch glimpses of Christ as our great High Priest and our Prophet who teaches us wisdom from above.Each meditation is an effort to bring out of the psalm some aspect of Christ’s person or work for us to ponder and wonder at. The emotions we feel and the hard questions we ask in the many trials of life are honestly and skillfully brought forward and then dealt with in the light of Christ’s own trials – and his great work of salvation! The answer to our sin and sorrow is found only and abundantly in Jesus, and each devotion leads us to him.Short & to the PointYou might be wondering: with so much packed in, how long are these pieces? I haven’t got that much time! Do not worry: each devotion is 400 words or less – no easy feat for us sermon-writing ministers! Two meditations are offered per psalm with the result that often the main Bible reading divides the psalm into two parts (typically up to 12 verses per reading). At times a secondary reading from elsewhere in Scripture is offered for those who wish to read more and reflect further on the subject matter. Each author has chosen one key verse from the psalm and worked out one main thought.The idea is to allow busy individuals and families to take in a focused, Word-based meditation that will feed their souls with the gospel of Christ and still allow them to catch the bus, get to work on time or arrive at soccer before the whistle blows. We hope and pray that our heavenly Father will bless you in this way.Special EventsThere is one more feature of the Devotional that we hope will interest you. At certain times of the year we often commemorate and celebrate the saving works of Christ: Christmas, Good Friday, Easter, Ascension Day and Pentecost Day. Many Christians and churches also pay attention to the need for God’s blessing during the planting of the crops (Crops and Labour prayer service), gathering in of the harvest (Thanksgiving Day), and the turning of the New Year of our Lord. Several contributors have worked out a series of psalm-based, Christ-centered meditations that bring each of these topics to light.When a special event is coming up on the calendar, you can prepare to mark it by using the specific meditations found in the back of the Devotional. There are several on each topic so you or your family can read a few over the days leading up to the occasion. It may sound amazing but it’s true: the Psalms do speak to all of Christ’s work and make for thought-provoking, encouraging meditations that direct all glory to our Saviour. Teach science through stories using the Charlotte Mason approach. Journey to the Holy LandYou and Dave (Stotts) will begin your adventure by taking a step between the pages of the Old Testament - back in time, before the existence of Israeli - to walk alongside the Patriarchs: Abraham, Isaac, and Jacob. You'll then slip into the shadows of the pyramids of Egypt, to behold the extraordinary miracles of Exodus. You'll cross the Jordan River into the Promised Land, walk the shores of the Dead Sea, witness the destruction of Sodom and Gomorrah, hike the barren desert to the peak of Masada, witness the epic battle between David and Goliath in the Valley of Elah, wander the ruins of Jericho, and find yourself face-to-face with the Dead Sea Scrolls. You and Dave will then take a turn into the New Testament, on a mission to follow the footsteps of Christ. You'll begin by watching the Prophesies of the Messiah unfold, and witness the Star of Bethlehem root itself in the night sky as a magnificent announcement of the birth of Jesus. As you journey from destination to destination - from Nazareth, to the Sea of Galilee, Capernaum, Mount Moriah, the Temple Mount, the Dome of the Rock, the City of David, the Mount of Olives, the Garden of Gethsemane, to name just a few - you'll witness the life of Christ, his crucifixion, and finally his resurrection. What's included?12 episodes. 6 hours. 4 disks.Disk 1: Covenants, Kings, and the Promised LandEpisode 1: Introduction to the Series, Patriarchs, Exodus, Overview of Conquest, Lachish, Be’er Sheva (Beersheba)Episode 2: Arad, Dead Sea, Sodom & Gomorrah, MasadaEpisode 3: King David, Khirbet Qeiyafa (David & Goliath & the Valley of Elah), Ein Gedi, Qumran, Dead Sea ScrollsDisk 2: Conquest, Canaanites, and the Holy CityEpisode 1: Arrival in Jerusalem, 2-min. History of Israel, conquest sites, Jericho, and HazorEpisode 2: Samaria, Shechem, and ShilohEpisode 3: Jezreel, Meggido, and Tel DanDisk 3: Miracles, Messiah, and the Roman EmpireEpisode 1: Transition to New Testament, Prophecies of the Messiah, and Bethlehem (including the Church of Nativity, Shepherds Field, and the Star of Bethlehem)Episode 2: Nazareth, Sea of Galilee, Jesus’ Boat, Capernaum, the House of Peter, Synagogue at Capernaum, and TabghaEpisode 3: Caesarea Philippi and Caesarea MaritimaDisk 4: Temple, Cross and the Empty TombEpisode 1: Mount Moriah, Temple Mount, Al Aqsa Mosque, Dome of the RockEpisode 2: City of David, Pool of Siloam, Mount of Olives, and the Garden of GethsemaneEpisode 3: Prophecies, Caiaphas, Crucifixion, Resurrection, and the Church of the Holy Sepulcher, and much more! Grammar Disasters & Punctuation Faux Pas These fun, highly-acclaimed products teach grammar, punctuation, spelling, capitalization, and critical reading in a standards-based thinking approach to language mechanics instead of the usual drill and practice found in competing products. Each level has easy-to-understand lessons that explain and illustrate the mechanics of writing followed by activities that require students to carefully analyze and edit stories, letters, and articles that contain mechanical errors. This effective method allows students to gain mastery over concepts that will translate into their own writing.